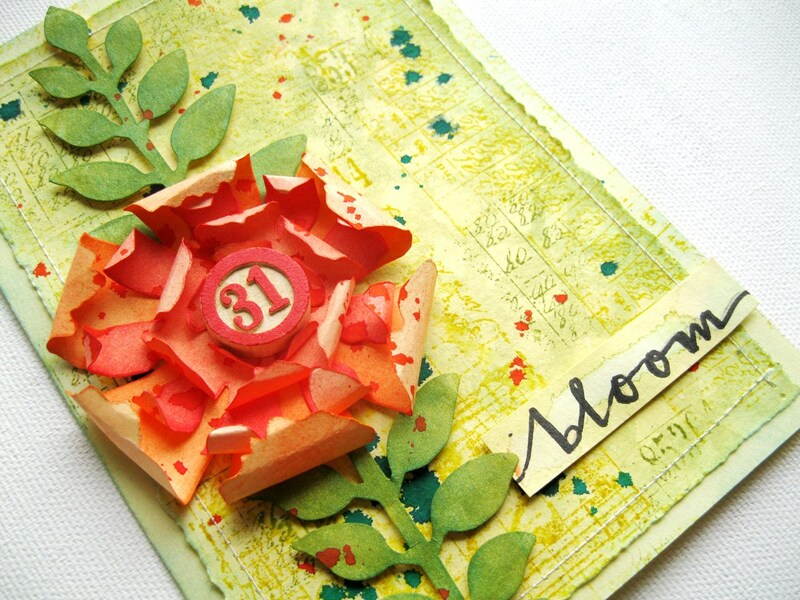 Learn an irresistible technique when you make this card that celebrates the arrival of spring. 1. Rub Collage Glue Stick to Latticework Layering Stencil. 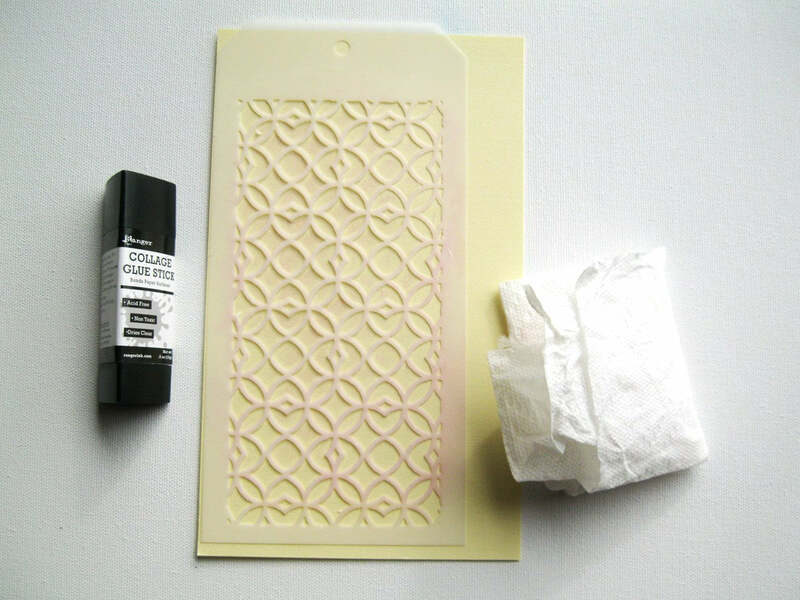 Lay stencil glue side up on Manila cardstock and move the glue from stencil to paper with clean dry paper towel to create a resist design on paper. Wash off stencil immediately. Check out Dyan Reaveley’s demonstration of this technique here. 2. 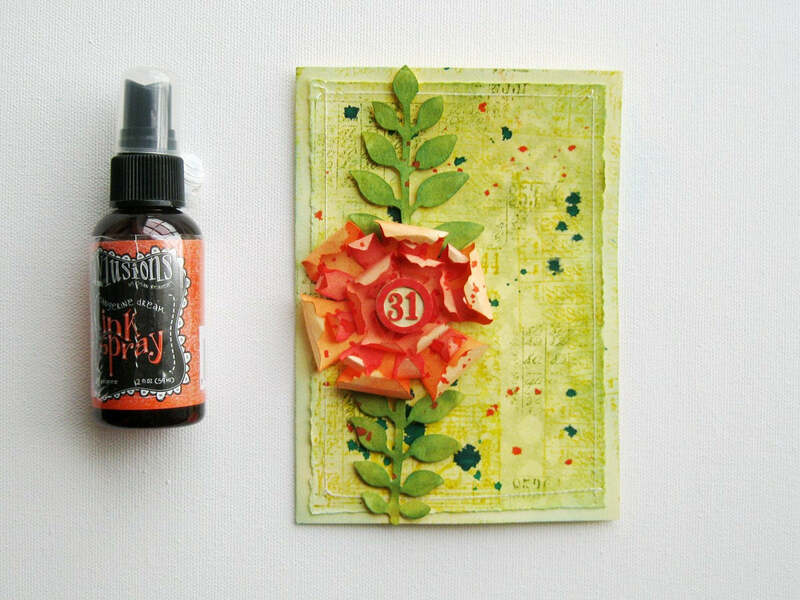 When the glue feels dry to touch, apply Peeled Paint Distress Ink with Ink Blending Tool on and around the glue area. Spray water with Mister and wipe off with clean dry paper towel to reveal the subtle design. 3. Mark the paper at 4” x 5½” using ruler and pencil. 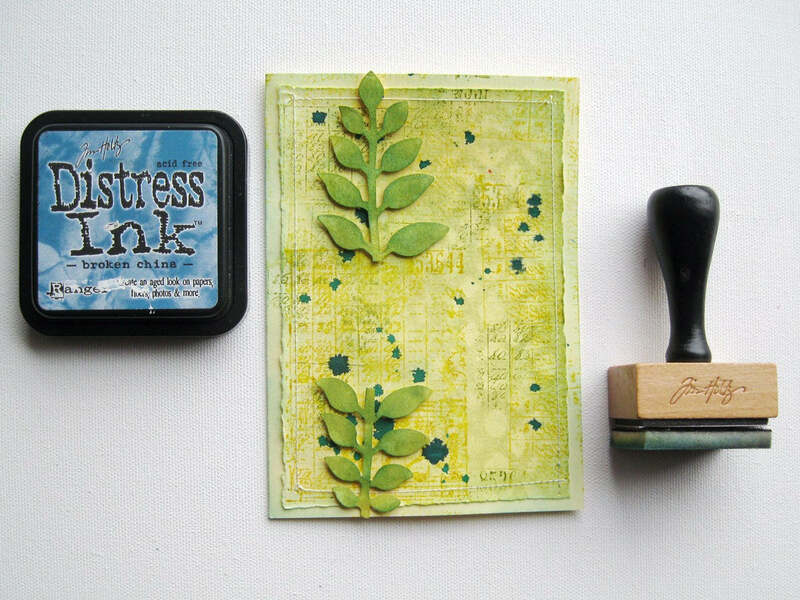 Fold and crease with Paper Creaser along the marks and gently tear the paper. Save the scraps for later. 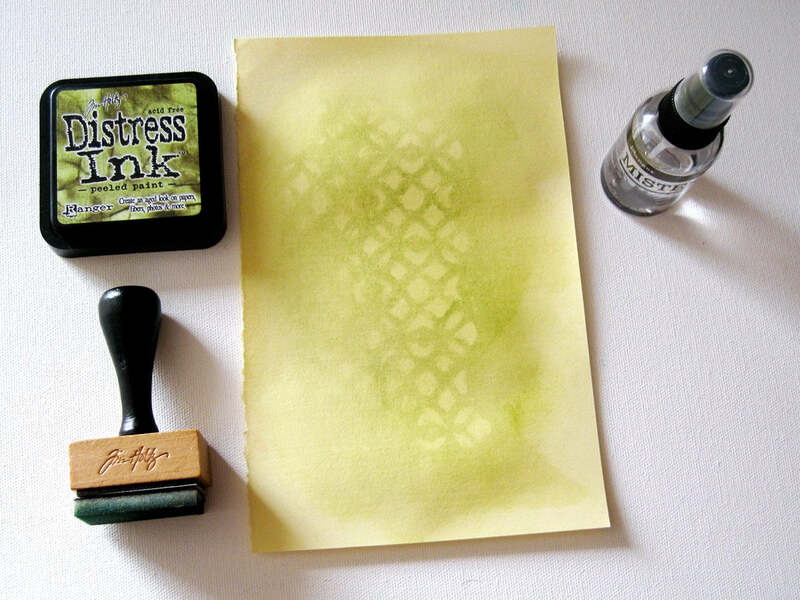 Using Mustard Seed and Peeled Paint Distress Ink pads, stamp a background randomly on the paper. 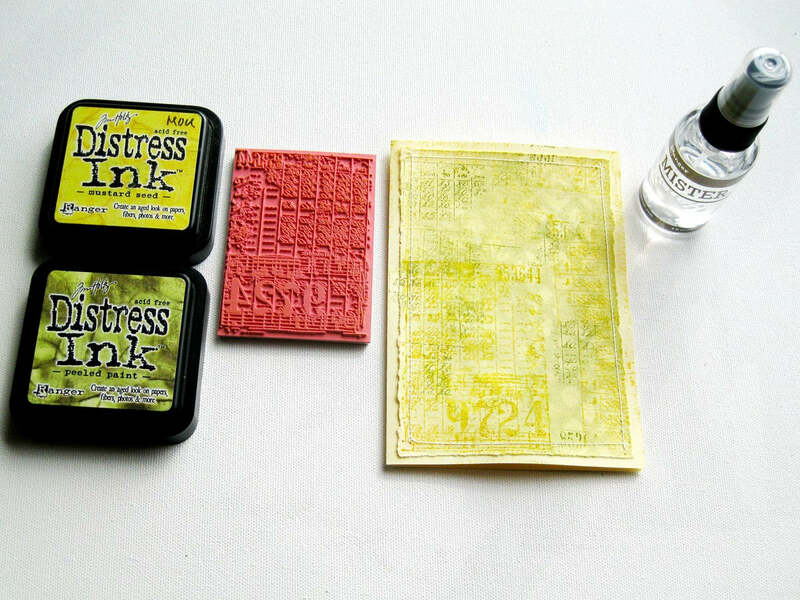 Spritz water to make the Distress Inks react. Dry with Heat it Craft Tool. Stitch it to the center of a 4½” x 6” card made out of Manila cardstock. 4. 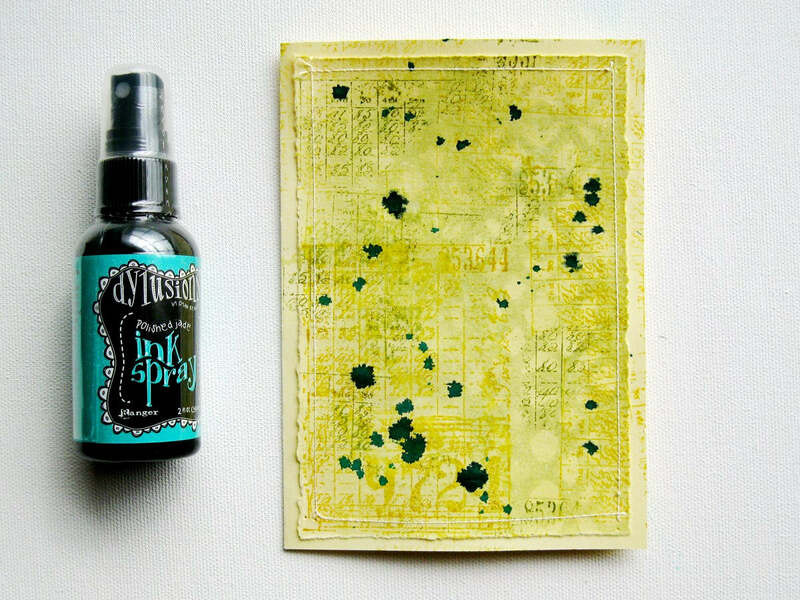 Take the cap off Polished Jade Dylusions Ink Spray bottle and splatter some ink on the card by gently tapping the straw attached to the bottle cap. Dry with Heat it Craft Tool. 5. Diecut some Tattered Florals and Garden Greens from Manila cardstock using Sizzix Big Shot machine. 6. 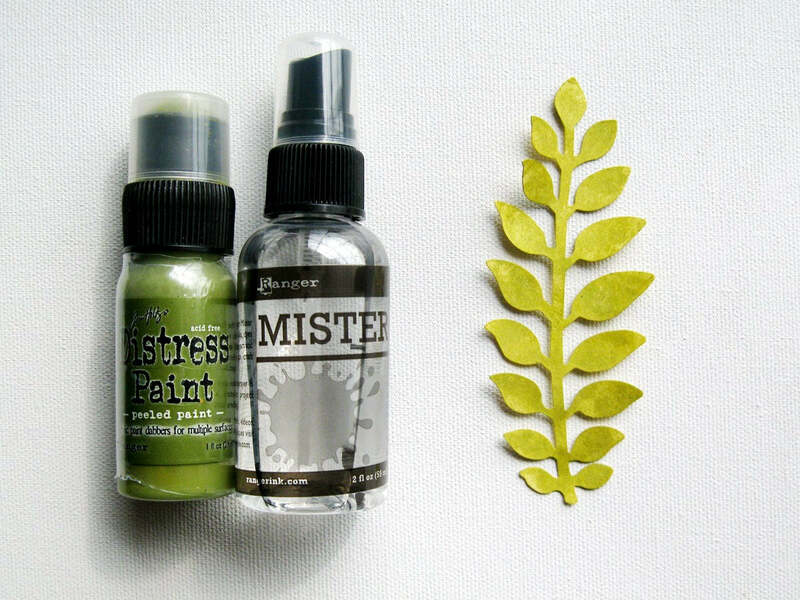 Color a stem by dabbing on Peeled Paint Distress Paint. Spray with water using Mister. Dry with Heat it Craft Tool. 7. 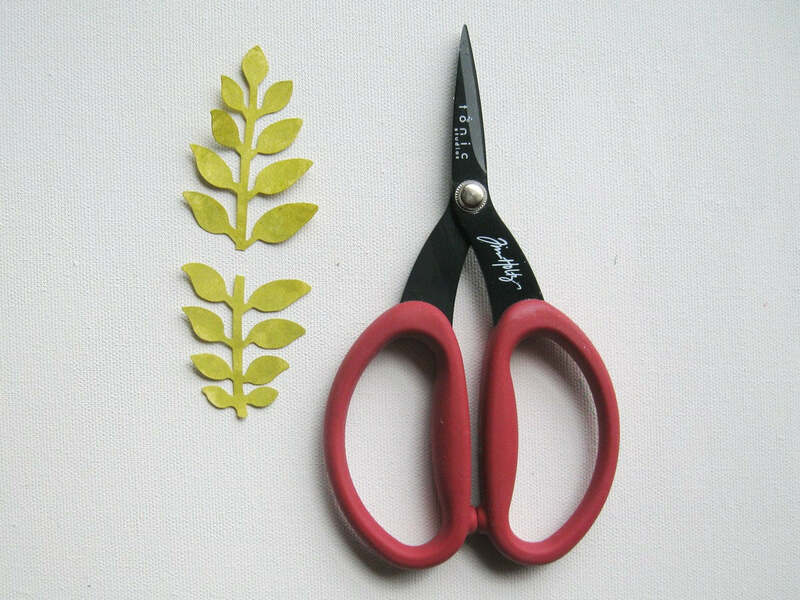 With Kushgrip Snips scissors, separate the stem into two parts as shown. 8. Attach the stem parts to the card using Popit Shapes. Add more color to the stem as well the edges of the card with Broken China Distress Ink Pad and Ink Blending Tool. 9. 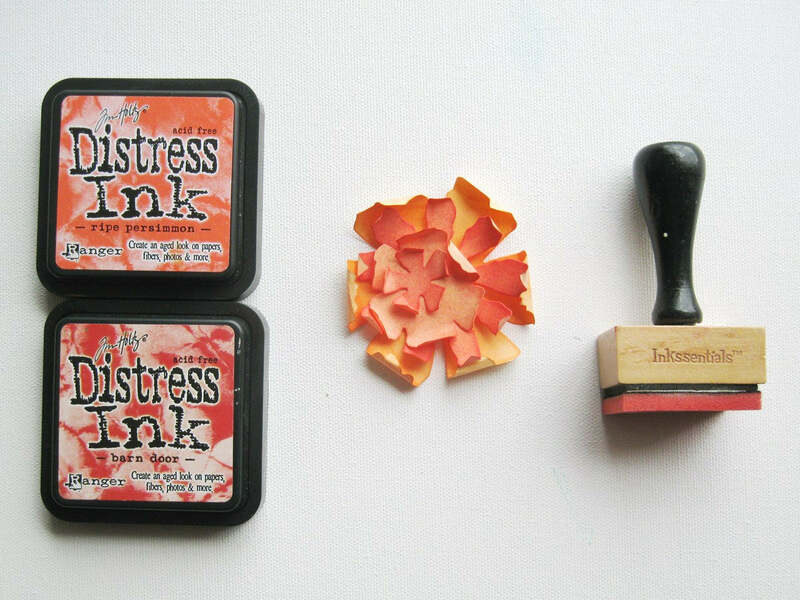 Color the Tattered Florals die cuts using Barn Door and Ripe Persimmon Distress Ink Pads and Ink Blending Tool. Sculpt each piece with your fingers to add dimension. 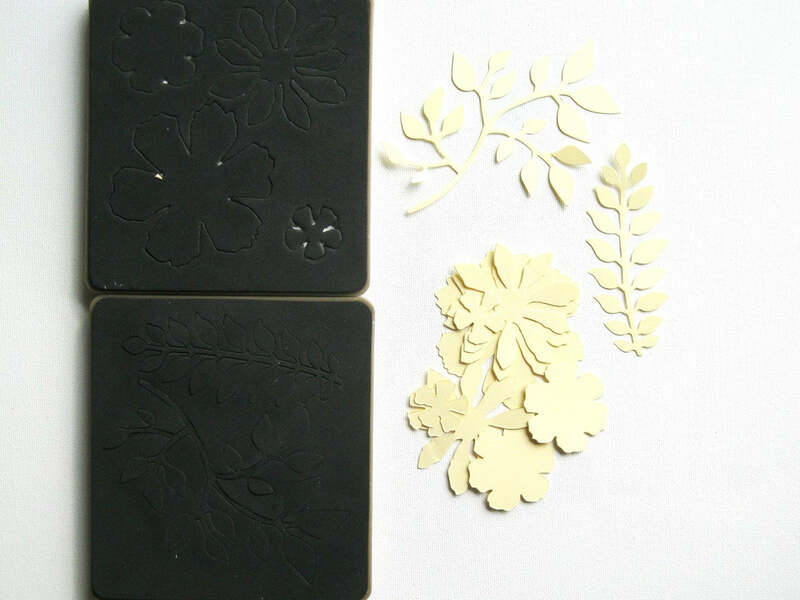 Stack the parts to make a flower using Collage Glue Stick only in the centers of the parts. 10. Attach the flower between the two sections of the stem. Using the splattering technique from Step 4, splatter some Tangerine Dream Dylusions Ink on the card. When dry, add a game piece or another small accent to the flower center. 11. With brush tip of Black Soot Marker, write the sentiment on a small piece of cardstock left over from Step 3. Cut around the sentiment with Kushgrip Snips scissors and attach it to the card with Popit Shapes to finish.